These are the hydrogen form of our strongly acidic cation resins which are used in catalysis. There are SK-grade of gel type, PK-grade of porous type, and RCP of highly porous type. The standard shipping form is hydrogen form as such counterion is needed to run an effective solid phase acid catalysis. The gel type SK catalysts can be used in aqueous reactions and where the hydrophilicity of the reaction medium is high such the esterification of methacrylic acid, ester hydrolysis, and esterifaction of acetic acids with methanol. Some special modification of these resins are also offered for high selectivity BPA formation. The PK resin grades are based on a porous styrene DVB polymer matrix. Their porous structure provides excellent durability against osmotic shock by swelling and shrinkage. They can used in similar applications as the SK type in hydrophilic mediums but their porosity allow them to also work in non-aqueous mediums as well such as esterification of acetic acids with longer chain alcohols. 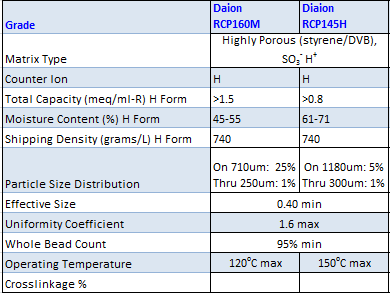 Diaion RCP160M is based on a macroporous crosslinked polystyrene matrix with sulfonic acid functional groups. These matrices are more open and porous than conventional grade resin with increased polymer surface available for intimate contact with solutes. In catalysis, the reaction rates are faster with RCP160M than standard grade resins, resulting in a higher degree of conversion during catalytic applications. It is also the preferred resin in non-aqueous reactions such as the hydration of olefins and alkylation of phenols.